Bruce Jenner has recently transitioned from sideshow to the center ring of Cirque du Kardashian. Thanks to his evolving sense of self, the reality star and one-time Olympic golden boy is earning headlines at a rate not achieved since his days as America’s buff breakfast buddy. 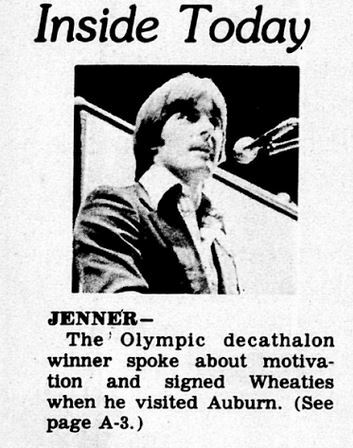 How big a deal was Bruce Jenner after destroying the Decathlon at the 1976 summer games in Montreal? So big he could call Auburn “Alabama” to its face and not be booed. “Boy, it’s great to be at the Univesity of Alabama.” That was the very first thing out of his mouth when he stepped up to the podium at the Student ACT. 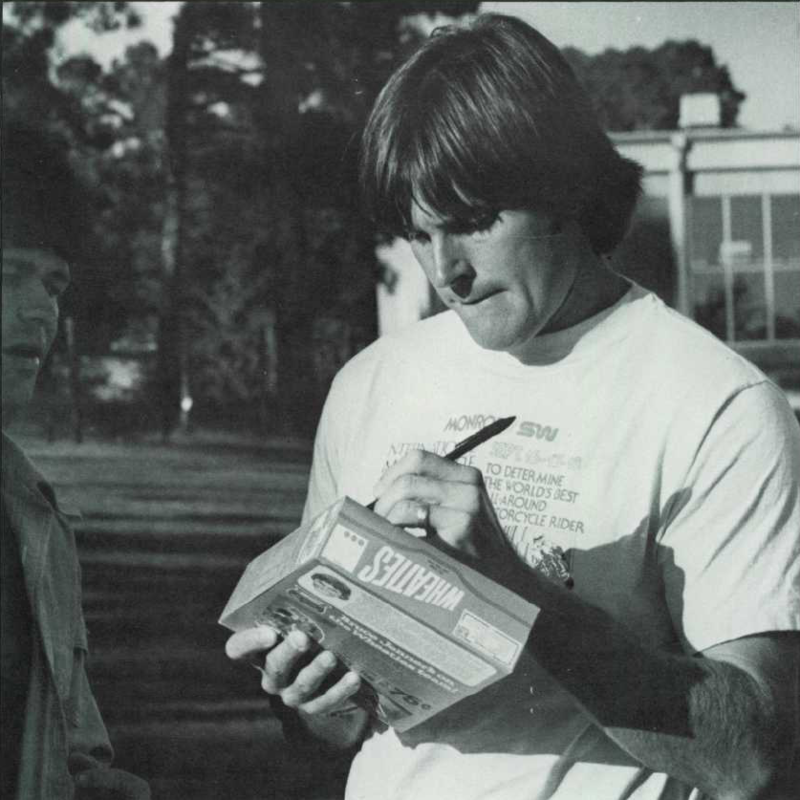 Jenner was the first speaker in Horizon’s 1977 fall lecture series. We’re assuming someone corrected him. But according to the Plainsman, no, no one booed. Two years earlier, John Denver had gotten the Bronx cheer at Beard-Eaves just for thinking he was in Augusta, Ga. John Denver was no Bruce Jenner. Positive thinking, not quitting, no regrets: These were the motivational talking points of Jenner’s Oct. 10 presentation, which began at 8 p.m. and featured a film of “the world’s greatest athlete” running the 1,500-metre run, the last event of the Decathlon that won him a gold medal and the Wheaties box. A few hours earlier he’d squeezed in a work out at the Wilbur Hutsell track. Then he headed to Sewell Hall for dinner with the football team. Barfield’s boys had just come off a disappointing home loss to North Carolina State and were gearing up for Georgia Tech. “Losing can do two things,” Jenner told the team. “It can make you afraid of a making a mistake, afraid of winning, or it can make you more determined to win. Georgia Tech, 38 – Auburn, 21. Related: Muhammad Ali on the concourse.